So...we meet again. I haven't posted in a while, shame on me! I joined Ravelry [http://www.ravelry.com/], and so far I say- ITS COOL!!! Well, I just found out that one of my friends thinks I'm (swallows) stalking her. Some friend she is, and she didn't even tell me to my face. I had to hear it from two people. Also- My ex-friend who called me clingy has reappeared again. Trying to be friendly, ha! (To self- I shall not be offended, grudge bearing and rude. Say it again. I shall not be offended...) I will be nice to her, but I will have her know that her friendship is like a bruise, and every time she *tries* to be friendly I feel like walking off in a huff. It's not my fault she has no friends. Currently reading: Breaking Dawn, again. Currently listening to: Steam - Na Na Hey Hey (Kiss Him Goodbye). Current mood: Slightly pissed would be a major understatement. This is going to be a short, quick post. I have discovered hyperbolic crochet!!!! Hyperbolic Crochet is the name given to applying a mathematical principle to crochet patterns. A hyperbolic plane expands exponentially from any point on its surface, always curving away from itself. Hyperbolic growth gives rise to the ruffled shapes of coral, kelp, and sea anemone. You can easily crochet a hyperbolic surface by increasing at a constant rate throughout the piece. 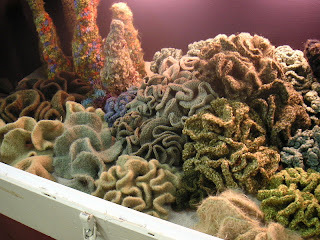 Crocheting a reef is a great opportunity to try different yarns and stitches. The variety of textures and shapes will inspire you to expand your crochet boundaries. I'm not quite sure exactly what it is and why its important, but I know its cool! I started making one with Red Heart Super Saver in shade 950, Mexicana (see picture below.) It looks so cool! Pictures will be up soon! p.s.- Go to http://www.theiff.org/oexhibits/05b.html . It has everything i'm too lazy to type on there. So... Hi again. A lot has happened since I last updated. Right now I'm in Washington D.C., here to watch Obama's Inauguration! It's really cold here, an I am complaining bitterly about the fact that the weather is like this, and no snow! Forgetting that though, when I heard about the temperatures (when I just got on the plane) I stitched up this cute hat in less than the plane trip from Montego Bay in Jamaica to Washington D.C. in the U.S. 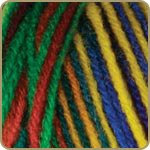 I used Lion Brand Yarn Wool-Ease® Thick & Quick® in Lemongrass, Sky Blue, Claret and Lumberjack Red. Cool, eh? Row 1: Single crochet in 2nd chain from hook, double crochet in next chain, *single crochet in next chain, double crochet in next chain; repeat from * across, end with a double crochet in last chain - 28 stitches. Row 2: Chain 1, turn, *single crochet in next double crochet, double crochet in next single crochet; repeat from * across. Repeat Row 2 until piece measures 9 in. or 23 cm (about 9 or 10 rows) from beginning. Fasten off. 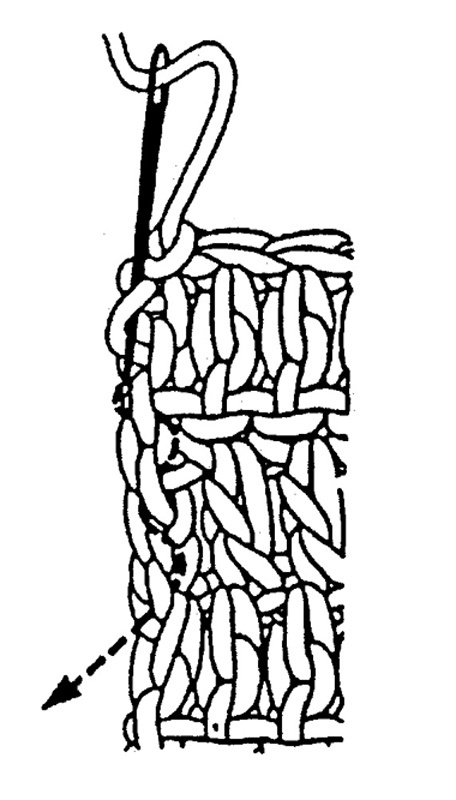 Seam ends together using a slip stitch seam. This is done by turning the work over to the wrong side, and joining the right sides of your work together so the seam is worked on the wrong side. Slip stitch each stitch on the end of a row together. Thread yarn through each stitch of last row and pull to gather. Knot securely. Weave in ends. 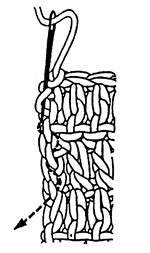 Tie a small knot, and then with the wrong side facing, thread a blunt-pointed needle with the end of the yarn. Carefully weave the needle along the back of the stitches about 2 to 3 inches on a diagonal, gently pulling the yarn end. Weave the other yarn end in the opposite direction. When finished, gently stretch the fabric in all directions so the fabric does not pull. Trim excess yarn ends. 1. Cut two cardboard circles the size you wish the finished pompom to be, then cut a small hole about a quarter of the size in the center of each one. 2. Measure off approximately 6 strands of yarn, 2 yards long (or longer depending on how fluffy you want your pom pom). Hold the two cardboard discs together in your left hand and wind the strands of yarn through the hole and around the rim as shown below. The amount of yarn used will determine the fluffyness of the pompom. 3. Insert sharp scissors carefully between the two cardboard discs and cut the yarn all around. 4. Separate the discs slightly, take a strand of yarn 12 inches long and wind around the cut strands (between the discs) twice and tie tightly. 5. Remove the discs and trim any stray ends. [Sources used in this post: http://www.lionbrand.com/patterns/70490AD.html?noImages=0, http://www.woolcrafting.com/crochet-seams.html, http://www.knit911.com/crochet911.html and http://www.craftown.com/crochet/pat15.htm. I changed mine slightly by adding more colours. you like? Once upon a time, there was a teenager. This was no ordinary teenager, mind you, because her name was Gabrielle and as you know, nobody named with such a fabulous and fantastic name as Gabrielle could ever be ordinary. One when this Gabrielle was in 7th grade, someone taught her how to crochet. Taken in with this unique and amazing craft, she bought her own skein of yarn, and her own size 7mm crochet hook (very small) and she sat down and crocheted a crooked little thing that now resides on her dresser, underneath a little figurine. Sadly, this thing was not more than four inches across, but this lovely Gabrielle was now, permanently, hooked (literally) for the rest of her life. She saved that skein of yarn like it was more precious than gold, saving it carefully for just the perfect pattern. She waited, and waited, and waited some more, searching for the perfect pattern to use this very fine thread. While doing so, she had just realized that crochet was so much more than old ladies simply sitting down and making doilies and table runners. There was a world of patterns and things to make and do, if only you had the right sized hooks. She once again delved deep into the world of crochet. Coming out victorious, she savored her elation as she garnered three skeins of blue yarn, and one skein of purple and a G/6 crochet hook to top it off. Now she had to carefully plan the use of this yarn, and lo and behold, her aunt gave her a book with about 24 patterns. After careful evaluation, she chose a pattern and started it. Alas, disaster struck and something went wrong. Nobody know exactly what happened, but Gabrielle is convinced it was a pattern, and the pattern is convinced it was Gabrielle. Anyhow, she became discouraged and temporarily banished all her yarn and hooks to a dusty corner to grow knots and gather dust. It seemed like the end to the story until the day she discovered how and why everything was going wrong. She picked up the hook again. Then her sister brought the most wonderful thick, soft yarn and a P/15 hook. She had gotten a ticket to Obama's inauguration, and since people don't usually have winter clothes in tropical countries, she crocheted a scarf and some embellishments for it too. Then her sister made her and ear warmer. She made her sister a long promised hat. Then she found a comprehensive, complete encyclopaedia of crochet and had and excellent idea for a crocheted product she calls "DreamCatchers (c)" and is now developing this idea. This story never ends. It's my story. Change it a little and it could be a a lady who lives many miles away and has never met me, or a man who crochets in secret for fear for being ridiculed. It could be a collage student's story, or a lady you saw yesterday crocheting on the bus, or a great-aunt who made a sweater who has been passed for generations, or the woman wearing the cool scarf, or the teen with the cute handbag, or the lady working in the yarn store,or the woman who made such warm, warm socks for her son. In a way, all crocheters are alike. We're all cool. we all like crafts. We all crochet. Why don't you crochet too? Open up a world you never imagined. Pick up a hook.